Pregnant belly with big mosquito. Zika infection control concept. Picture with space for your text. If you’re pregnant in this first summer of Zika in Florida, how worried should you be? I’ve seen news reports about pregnant women in Miami, where the first cases of locally acquired Zika infections in the continental United States appeared in July. One report was about an obstetrician who was making it a priority to spend her off-work hours inside at home. Another was about a woman who hadn’t left her house in three weeks. A pregnant friend of mine is facing this with alert calm. Not panicking, but not being complacent, either. Knowing she lives in Florida, where Aedes genus mosquitoes linked to Zika virus also live, she applies bug repellant on a daily basis. 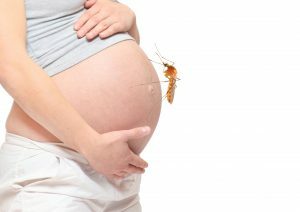 Bug repellant is safe for pregnant women when used as directed, according to the Centers for Disease Control and Prevention. In fact, the agency recommends it. Her husband also is careful and keeps a can of bug spray in his car. The disease can be transmitted sexually by an infected partner, which means he needs to stay away from mosquitoes, too. She talked with her doctor after the Florida Department of Health announced a case of homegrown Zika was found in her county. The odds of her coming in contact with the virus are still low, he assured her. A greater concern, he added, would be if she started to become highly anxious and had panic attacks. Although Florida hasn’t escaped homegrown Zika infections this summer, health officials don’t expect huge outbreaks like those that have occurred in Brazil. Robust mosquito control has been a priority in the state for decades. Window screens and air-conditioning are also common and limit exposure to insects. Daily weekday updates about Zika in Florida are posted on the Florida Department of Health website. As of early September, there were nearly 600 cases of travel-related Zika cases in Florida and 56 cases of non-travel-related Zika; 80 of the infections were in pregnant women. Thankfully, Zika isn’t expected to be life threatening or severe for most people. Many who get the virus won’t even have symptoms. Zika fever is said to be milder than other diseases, such as dengue, that are spread by the same type of mosquito. But Zika isn’t a minor concern for pregnant women or those planning to become pregnant in the near future. Presently, there are too many unknowns about how the virus causes birth defects. This is why the CDC recommends an abundance of caution for pregnant women. It recommends they avoid destinations where Zika is circulating. The agency’s Level 2 advisory list now includes more than 50 countries in South and Central America, the Caribbean and Pacific Islands. Singapore was the latest country to be added in late August. The CDC also recommends that pregnant women avoid sections of Miami where homegrown Zika cases have been found. If you’re expecting a baby or planning a pregnancy, talk to your doctor about how to stay safe. There are protocols for when to test for Zika and the Florida DOH offers free testing for pregnant women at county health departments. It’s good to remember the advice from my friend’s obstetrician, too. Staying calm and avoiding panic attacks also are beneficial for pregnant moms.